“For truth consists of nothing else than the self activity of personal appropriation,” Kierkegaard whispered in his ear. This was the poetry world, after all, not the real world. In this world, language was used to signify reality. Yet this was the world which he’d inhabited most of his adult life. What began as a romantic fantasy had become an undeviating obsession. Practically all his waking consciousness was taken up with poetry and poets. Poetics, if there were such a thing, was the fabric of his reality, woven during the day and unraveled at night. Why does it matter, he mused, that some poets write poems like an iron clad argument when there is no need for argument, no argument at all. It’s only language, after all, a house of cards at best. Pity writers, especially poets, all they know is language. It’s as if Archimedes had said “give me a sentence and I will move the world.” That feathered offspring of great lizards whose domain they covet has given them a sequence of sounds upon which to develop their own flights of fancy. Language exhibits many properties of the autonomous agent, co-evolution, community, and creates its own lexisphere, moving toward greater complexity while allowing for a superior ability to conceive as well as understand. A good poem is revelatory as it steps into the adjacent possible. It’s important to have the voice of speaking in poetry as well as the voice of intellect, and those seeking originality will appreciate folk speak for its oracular potential, the riddle that language unfolds. The mind speaking takes an unknown path. Language, that ingrained attribute, conspires against the body in its breakaway republic of imagination. It works like light to express the shape of the ineffable. Niche determining, language is a metaphoric process in which the comfort of perfected stasis tries to maintain balance in the face of unexpected revelation at the turn of a phrase, tricking order out of chaos, and chasing information along the thermodynamic gradient. Truly mutable, language traces the evolution of the psyche. A poet’s medium is this most common of attributes. Everyone uses language every day. Poets do what is obvious: they deal in the mysteries of the self-evident. Poems occupy the event horizon to the black hole of meaninglessness. 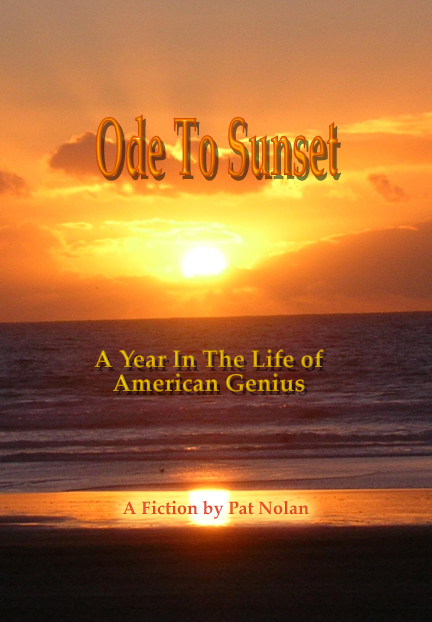 This entry was posted in Fiction and tagged American Fiction, Carl Wendt, Charles Baudelaire, Charles Bukowski, flaneur, Flann O'Brien, Frank O'Hara, Han San, Hugh Kenner, Jack Kerouac, James Joyce, Jazz, John Coltrane, Ode To Sunset, On-Line Novel, original hipster, Pat Nolan, Poetry, Poetry Scene, Poets, San Francisco, serial fiction. Bookmark the permalink.